The Radar Set AN/SPS-73 is a short-range, two-dimensional, surface-search/navigation radar system that provides contact range and bearing information. 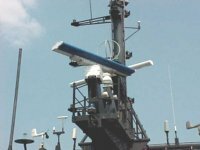 The AN/SPS-73 provides for improved signal processing and automatic target detection capability. The AN/SPS-73's surface-search function provides short-range detection and surveillance of surface units and low-flying air units, while the AN/SPS-73's navigation function enables quick and accurate determination of ownship position relative to nearby vessels and navigational hazards. The AN/SPS-73 includes its own display indicator, which is capable of displaying radar contacts from the AN/SPS-73 radar or other shipboard radars. Radar videos are displayed on consoles to provide a means for the operators to perform manual radar search, detection and tracking functions. Radar triggers and antenna bearings are used to properly display radar video data on the consoles. True bearing indications are displayed on the consoles to indicate whether the track position is displayed in relationship to ownship heading or true north. AN/SPS-73 radar video is displayed on the ship control console in the Pilot House to provide an alternate source of navigation data to the Officer of the Deck. Radar triggers and antenna bearings are used to properly display the Furuno radar video data on the ship control console. Radar video from the AN/SPS-67 Radar is provided to the AN/SPS-73 SAOP console processor in the Pilot House to provide the Officer of the Deck an alternate source of navigation data for processing and display. AN/SPS-67 radar trigger and antenna bearing are used for navigation processing, and to properly display the AN/SPS-67 radar video data on the AN/SPS-73 SAOP console.